This week’s good news comes to us from Medina, Ohio, located a half hour west of Akron. It’s legal to euthanize animals in gas chambers in Ohio, but Medina County voted recently to no longer use such inhumane methods. 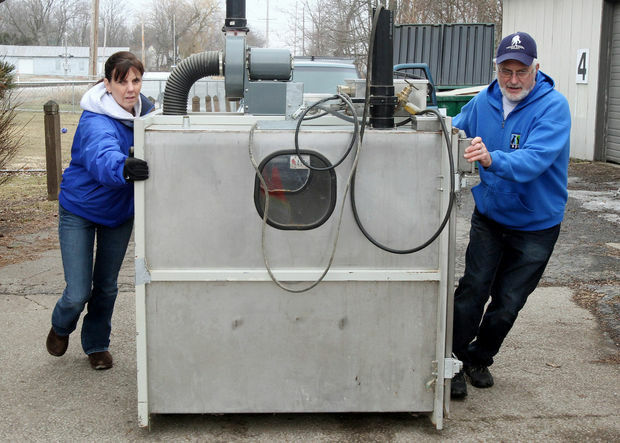 And when an anonymous donor agreed to make a $10,000 donation to the Medina Society for the Prevention of Cruelty to Animals if their agency would take possession and destroy the gas chamber, the County Commissioners sold it to MSPCA for $1. MSPCA then held a fundraiser, eliciting donations for a chance to take a whack at the darn thing. 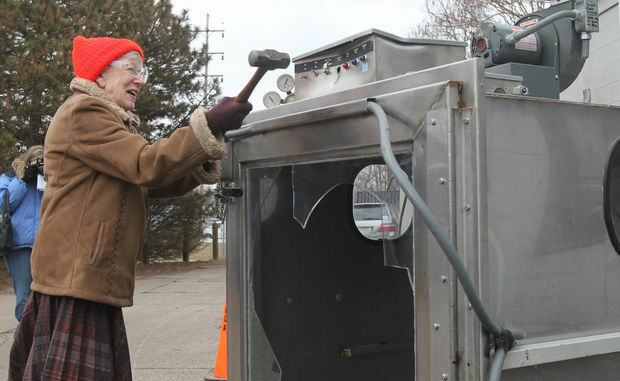 Thirty people donated a total of $2500 for a chance to hit the gas chamber with a sledge-hammer. What was left was sold for scrap. « A Poem for Spring! Hooray! I would have liked to have a good wack at that darn thing! I would have liked to hike my leg on it! We were thinking the same thing!!! I agree, Kevin. But slowly we’re getting rid of them. This way looks mighty satisfying to me! We agree, that IS great news! Bet lots of people had fun taking a whack at that horrid thing! I know I would have loved to have peed on it! Wow, awesome! Awesome! What a great story. And a great post as well. This is great news. And, thank you to the anonymous donor. Oh good for them!!!! I would have loved to take a few wacks at the thing also!!! Sorry that we were not there to take a whack at the death machine. Gas chamber for anipals is forbidded by PM law! Absolutely da pawsunest newz we read all week too Rumpy!!! Now that IS great news – although I was shocked that a machine like that existed and was actually used on quite a few poor animals… what is it with us humans! …and what a brilliant idea donating money to be able to smash up this abominable thing!!!! You keep hitting awfully close to home lately! I’ve lived very near to Medina, too. At least it’s good news this time. How awful that such practice still happens to those poor animals.. I am so happy its now being smashed to pieces.. I hope too the law that allows such a practice is soon smashed as well.. Wonderful that someone donated to help it stop..
Chi Chi the Chihuahua (my adopted brother) would have liked to hike a leg in the general direction of that machine for sure and our person sure would have enjoyed womping it with a hammer or three. Thanks for sharing such good news! That is such great news; I hadn’t heard that story. Thank you, Rumpy! Excellent post and an excellent idea!!! Woohoo! another one bites the dust. We don’t stop till they are all destroyed. What a fab idea and brilliant brilliant news!